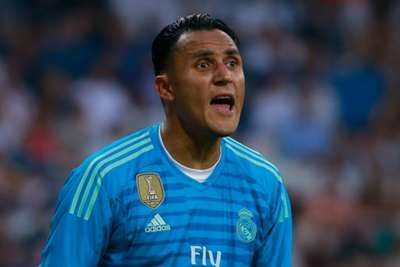 Real Madrid goalkeeper Keylor Navas criticised Santiago Solari, saying he never felt he would get a chance regardless of what he did under the former head coach. Navas made just his fourth start of the LaLiga season against Celta Vigo on Saturday, given his opportunity by Zinedine Zidane after the Frenchman returned to the helm earlier this month. The Costa Rica international said there was nothing he could do to convince Solari he deserved to play more often. "I did have the feeling that whatever I did in practice, I wasn't going to play," Navas told Cadena COPE on Tuesday. "But I've always been a professional. I was motivated to do things well because I'm privileged." Navas, who joined Madrid in 2014, is contracted until mid-2021 at the Santiago Bernabeu. The 32-year-old said he was focused on the LaLiga giants, but warned he needed to be playing more often. "I have a contract. My enthusiasm has always been at Real Madrid and I am focused on what is coming," Navas said. "I have given everything for this club and I will continue giving it while I'm here, but I don't want to spend another year like that."